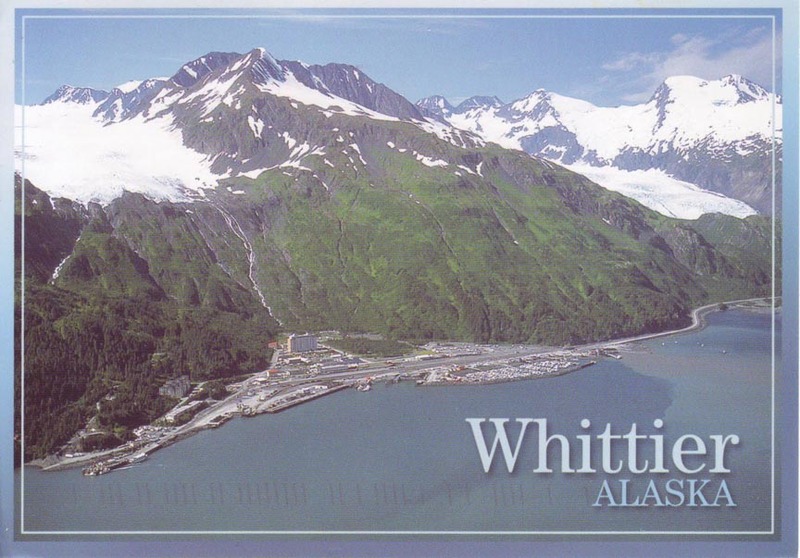 The town of Whittier is situated on the western end of the Prince William Sound, about 75 miles southeast of Anchorage and somewhat centrally located on the southern coast of Alaska. Before the twentieth century, the area had been used for centuries by the Chugach Indians to traverse the Kenai Peninsula. The Whittier Glacier and the eponymous town were named for American poet John Greenleaf Whittier. The settlement sits on a delta in which mountains rise to 3,500 feet within two miles on either side. In 1941 the United States military took an interest in Whittier to function as the backup port to the primary one at Seward, about 50 miles to the south. The military was drawn to Whittier for many reasons, primarily because it is the state’s only year-round ice-free deep-water port. It also has radar-unfriendly claustrophobic topography and famously terrible weather, which obscures visibility for much of the year. All desirable qualities for the military, to be sure – however its drawback was its isolation; at the time the region had no rail or vehicular access. The U.S. Army began construction of a rail line in 1941 from Whittier to nearby Portage, Alaska. Because Whittier is surrounded by mountains, connecting it to other towns required significant tunneling. From 1941 until 1943 Army engineer Anton Anderson led the largest tunneling project in United States history. When completed, the one-mile railroad tunnel through Begich Peak and the 2.5-mile railroad tunnel through Maynard Mountain combined for 13,300 feet. When it was finished, it was the longest tunnel in America. While the United States was engaged in World War II, resources were temporarily diverted away from Whittier, leaving little activity in the area for the next five years. On December 17th, 1945 the Army allowed the Alaska Railroad Company (the town’s chief non-government tenant) to assume operations in Whittier. The U.S. government returned to Whittier at the onset of the Cold War. The oldest surviving structure from this occupation is the Alaska Communication Systems (ACS) building, also the oldest concrete structure in Whittier (pictured below, source). Built in 1943, this self-contained secure facility housed the radio and telegraph communications equipment. During this time Whittier was a “SECRET” installation known as H-12. Whittier’s former ACS building, built in 1943, is now the Anchor Inn. In 1948 construction began in Whittier on the first of two enormous concrete structures. The “City Under One Roof” (aka Buckner Building, pictured below) was completed in 1953. It was a long, Brutalist monolith nestled into the side of the mountain on the east side of town, and served as the operational headquarters for the military. The “City Under One Roof” Buckner Building in Whittier, Alaska. Construction began on the 14-story Hodge Building in 1953. The building was named for Army civil engineer Colonel Walter William Hodge (pictured), the commanding officer of the 93rd Engineer Regiment on the Alcan Highway. Colonel Hodge died in a B-26 crash over Mount Hood in 1949. The Hodge Building was constructed as three separate towers connected by metal plates. The east tower was built first, followed by the middle tower, and finally the west tower, which was finished in 1957. The flat-roofed Hodge Building was the military’s residential tower, built for bachelor’s quarters and family housing. The Hodge Building under construction, circa 1956. The Hodge Building, circa 1957. The massive structures were, for years, the two largest buildings in Alaska. They were engineering marvels, built to withstand bomb blasts, earthquakes, fires, and 60+ mile-per-hour winds – all while housing up to 1,000 troops indoors across its 150 studio, two, and three-bedroom apartments. Whittier was an active military port until September 1st, 1960, at which time the facilities were placed on inactive status. Most of the tower’s 1,200 residents – at the time all Army personnel – were reassigned elsewhere. A skeleton crew stayed behind while the buildings were realigned as a sub-installation of Anchorage’s Fort Richardson. For the rest of the 1960s, Whittier’s population fluctuated between forty and seventy people. Those who stayed behind occupied the first four floors of the Hodge Building; other floors remained unoccupied. On Good Friday in March of 1964, the second most powerful earthquake in recorded history buckled the floor underneath Prince William Sound, registering a whopping 9.2 magnitude on the Richter scale. Whittier, just sixty miles from the epicenter, was severely damaged by the ensuing tsunamis, which brought waves up to 43 feet (13m) tall into town. Of the thirteen Whittier residents who perished in the Good Friday (or “Great Alaskan”) Earthquake, only one body was recovered. While most of the town was destroyed, the rail lines, docks, deep water wells, and massive concrete buildings remained largely intact. This propelled Whittier into a more important role as other regional ports who suffered more damage were inoperable. The mostly unused Buckner Building was not repaired following the earthquake, and remained unused. The impressive engineering behind the 14-story Hodge Building was on display as its three separate towers swayed – but miraculously did not collapse. In the basement of the Hodge Building, the plastic-lined water containers were also undisturbed. Former Congressman Nick Begich, missing since 1972. Whittier started to emerge from the Army’s shadow when the city was officially incorporated in 1969. Three years later, the Army transferred ownership of the two giant Cold War-era buildings (Buckner & Hodge) to the state of Alaska, which then deeded them to Whittier in 1973. In March of 1974 the Hodge Building was officially renamed Begich Towers in honor of Alaska Congressman Nick Begich (pictured), who went missing in October of 1972 after control towers lost contact with his Cessna 310. Begich was flying with House majority leader Hale Boggs from Anchorage to Juneau when the incident occurred. The search was called off after 39 days; the plane and its four passengers were never found. 1972 newspaper article about missing Congressmen. The Begich Towers Condominium Association of Apartment Owners was incorporated in 1974 as a 196-unit condo community. In addition to residential apartments, the building houses Whittier’s grocery store, laundromat, medical clinic, police department, post office, and the city offices. After its military service the building was modified for civilian life. There are pleasant touches (such as the exterior’s newer blue, cream, and peach paint scheme) that try to establish a playful identity for the formerly drab Hodge Building. Inside, the painted concrete hallways illuminated by the ubiquitous yellow fluorescent lighting always remind that you are inside what used to be a government building. One benefit of living at BTI is that kids don’t need jackets when they go to school in the winter because the town’s school was built immediately behind Begich Towers; it connects to the base of the west tower via an underground tunnel, which shields the kids from Whittier’s extreme winter weather. Next to the school and towers is the indoor playground (pictured), which protects kids from the elements year-round. Another Good Friday disaster would strike in March of 1989. The Exxon Valdez oil spill occurred when a ship ran into the Bligh Reef off the coast of Alaska, spilling nearly eleven million gallons of crude oil into Prince William Sound. As the closest town to the disaster, Whittier was an important base camp for authorities and clean-up crews, and its rail barges shipped the hazardous material out of Alaska. Before the year 2000 there was no vehicular access to Whittier. Anyone who wanted to bring a car or truck into the town had to ship their vehicle into town via boat or train. In 1998 reconstruction began to convert the rail-only Anton Anderson Memorial Tunnel for dual-use, allowing vehicular access as well. The two-year project cost $80 million to complete, and drastically improved access to Whittier. After the tunnel conversion, the trip to drive through cost travelers just $12. Since the vehicular passage in the tunnel is one lane, inbound and outbound traffic is staggered in fifteen minute intervals twice per hour; in the winter this shrinks to five-minute windows to keep the tunnel warm. At night the tunnel is closed. Initially there was backlash to the tunnel conversion by residents afraid of the potential population influx. Ironically, when the conversion was finished, more people moved out. In Whittier population turnover can be high, understandable given the lack of consistent, year-round work. During the summer the town’s population swells as boaters, fishermen, seasonal workers, and tourists descend upon the small port. When the sun returns to the sky, residents pour out of BTI in shorts and T-shirts. The temperatures reach the 50’s (F) during the best time of year. Winters paint a different picture. The population drops to less than two hundred, and the streets empty as most of the town moves back indoors. And for good reason: Sustained winds of sixty miles per hour are not uncommon. It can shatter windshields and rip your car doors right off. With 200 inches of rain and 250 inches of snowfall annually, only the dedicated stay in Whittier through the winter months. Most of the local businesses in Whittier are in “the triangle” by the waterfront or Anchor Inn building, but employment options are limited. The majority of the Alaska Railroad workers commute from Anchorage, as does Whittier’s mayor and all but one of the town’s police officers. Dock hands who unload the supply barges in Whittier also shuttle in from Anchorage once a week. Business development is a challenge, as there is very limited buildable land in Whittier. Alaska Railroad is the largest land owner, but it doesn’t pay property taxes and employs few locals. Tourism is a source of income for the town, although its guests tend to have brief visits. Between 700,000 and 900,000 people visit the town annually – primarily via cruise ship or passing through en route to Anchorage – but most don’t stay beyond one afternoon. Not all transplants survive the unique lifestyle at BTI. Adjustment is not easy, nor guaranteed, for those who make an attempt. Residents must learn to love their neighbors because despite Whittier’s isolation from the rest of the world, living in a tower with the rest of the town offers an experience devoid of privacy. The town does seem to attract those searching for separation of something: Establishment. Society. Their past. Some easily adjust and stay for 20+ years. Others don’t make it through the first winter, and liken the experience to being in jail. There are benefits to living in the Begich Towers. The weather might prevent you from leaving the building for months at a time – but you can go to the Kozy Korner grocery store in pajamas and slippers. Kids with questions on their homework can go down the hall and knock on the door to the teacher’s apartment. Parents don’t have to worry about kids and traffic at the indoor playground. The city officials are readily accessible on a daily basis. There’s no real threat of crime or terrorism. And if you have pet reindeer, you can keep them in a pen behind the building. BTI may not have everything you want, but it has everything you need. The building has Internet access and cable, and most rooms have WiFi. The post office is near the building’s entrance and the police station is just down the hall. There’s a health clinic on the third floor. The former military gym and basketball courts (pictured) are massive and offer an expansive indoor area for activity and exercise. The towers are not 100% occupied. It has vacant units for sale and some units belonging to seasonal residents. On the building’s top two floors are June’s Whittier Condo Suites, a resident’s bed and breakfast operation with nearly a dozen suites ranging from $155 to $265 a night. Each room has a big-screen TV, WiFi, and sweeping views of Alaska. Proving the Whittier experience is not for everyone, it has mixed reviews on TripAdvisor. If there is a fire, at least everyone will stay warm. I have been to Seward in 2009 completely missed this place. On my bucket list to spend a adventurous winter there. Thanks Harsh. I am not surprised if you missed it, Whittier really is tucked away. Unless you’re looking for it, it’s not hard to miss. Hope you get back there someday though, sounds like a unique bucket list item. Sitting here on my sunny front verandah in Australia where the current temp at 7.15AM is about 12 degrees Celsius ( and that feels rather chilly for me) I certainly take my hat off to those hardy folk who endure the harsh Alaskan winters! I’d go stir crazy a freeze to death living there. Cheers petchary, thanks for stopping by! This is excellent! A well researched and written article about an entire town living together under one roof in an inhospitable climate is exactly Sometimes Interesting at its best! Thanks my friend! This was an entertaining one to research, I really did enjoy learning about Whittier. I find it to be quite intriguing and wouldn’t mind stopping by one day to check it out. That’s some nasty weather they have there! Right? Sounds like an Alaskan hurricane. They don’t mess around up there. Sometimes I need to get away and explore different lives, worlds, times…I love your site! I got hooked reading about an ancient civilization underground…somewhere, and then there was the impressive estate of..Vanderbilts?? I dunno, I loved History, but probably my worst grades because I loved the stories, but didn’t care about names, dates, locations. As I guess is obvious. I enjoy reading how others live their lives. You might also enjoy the Palmerston Island article, also an interesting different life & world. Thanks for coming by and leaving a comment. I always liked the ideas put forth by Buckminister Fuller and his contemporaries of cities built upwards so that nature was left in vast spaces around it. This is a good example. Beautiful views and centralized services. Loved this piece. Thanks Noelle! I can’t help but think if Fuller was involved in building Whittier, its structures would be more self-sustaining and aesthetically pleasing. They probably wouldn’t be able to withstand a 9.2 quake though, although I’d like to see what his solution would have been to the Whittier housing situation. This site really needs a rename to “Always Interesting” even when the buildings are still in use. What an amazing little community that is indeed a community in the true sense of the word. Thanks for another very interesting story! This is really a special place! Thanks Truels, good to see you my friend! Fascinating as ever. I can’t help feeling that someone who could spend the winter in this building would be a good candidate for a trip to Mars. Yes! Indeed. The right frame of mind… and body. Being able to survive an earthquake of 9.2 is amazing, this building must be nigh-on invincible. Which would be good with the glacier hanging like the sword of Damocles over their heads. Thanks for the article. “Sword of Damocles” ha! Great reference potedude. Some of the photos sure do make the mountain look ominous. I share your reaction about surviving a 9.2 earthquake, that really is something else. Thanks for reading my friend! I’m curious to know how often the video rental store has to chase down late returns… Another wonderful article! What an extraordinary and fascinating place! Not for me to spend a winter there mind you but interesting insight into the minds of the people who would thrive in such a situation. The mountain and its glacier really does seem to ominously hang over Whittier. Great article as always. This is not a place I would like to live but it does sound like it would be a nice visit. In the summer of course. I live on the Kenai Peninsula, born and raised in Alaska (before statehood) and survived the Alaska earthquake. I just discovered your blog by accident and read the story about Whittier. I visit there often during the summer just as a road trip thing to do. The people that live there year around are true examples of the wonderful, resilient Alaskan spirit. I actually thought about moving there myself because crime is non-existent and you truly can choose to be as social or reclusive as you want to be. The drawback is being isolated for months at a time, with our long, dark winters it’s difficult to escape depression if you’re “locked in” to one location. Most Alaskans make an effort to do winter activities that take you out and away from home or the long dark days will get to you. Or we vacation for 2 weeks in Maui at some point during winter :). Anyway, I just wanted to stop by and say hi and thanks for the nod to one of Alaska’s interesting little towns. Thanks for the comment Cat, I’m glad you found the blog. I share your intrigue about living in Alaska (and also your hesitation with the long, dark winters). Respect to those who can pull it off, I can’t imagine it’s easy. I live in Papua New Guinea where it’s sunny and humid all year round. I must admit I found this article very interesting indeed. I’m an indoor person and I never run out of things to do at home especially when its so hot outside so I can’t imagine it to be any different for me if it were so cold outside. I’m certain I would never get bored. It sounds amazing!!!!!! Cheers Kimberly, thanks for the comment and great observation. I’ve lived in both extremes and know exactly what you mean, we find ways to stay inside on the worst days. I think I’m like you, I have enough things on my chores and to-do lists that I wouldn’t have the opportunity to be bored even if I had to stay inside for an extended period. Thanks for stopping by! So glad that I stumbled onto this blog. Have read several of your stories and find them all very fascinating.